VEX IQ Challenge – Bank Shot is played on a 4’x8’ rectangular field configured as seen above. Two robots compete in the Teamwork Challenge as an alliance in 60 second long teamwork matches, working collaboratively to score points. Teams also compete in two additional challenges; The Robot Skills Challenge where one robot takes the field to score as many points as possible under driver control; The Programming Skills Challenge where one robot scores as many points as possible autonomously, without any driver inputs. The object of the game is to attain the highest score by Emptying Cutouts, Scoring Balls into the Scoring Zone and Goals, and by Parking Robots on the Ramp. There are a total of forty-four (44) Balls available as Scoring Objects in the game. There is one (1) Scoring Zone, one (1) Goal, one (1) Ramp, and sixteen (16) Cutouts on the field. 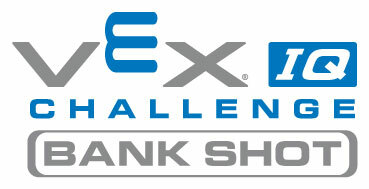 Download the official VEX IQ Challenge Bank Shot mobile app!